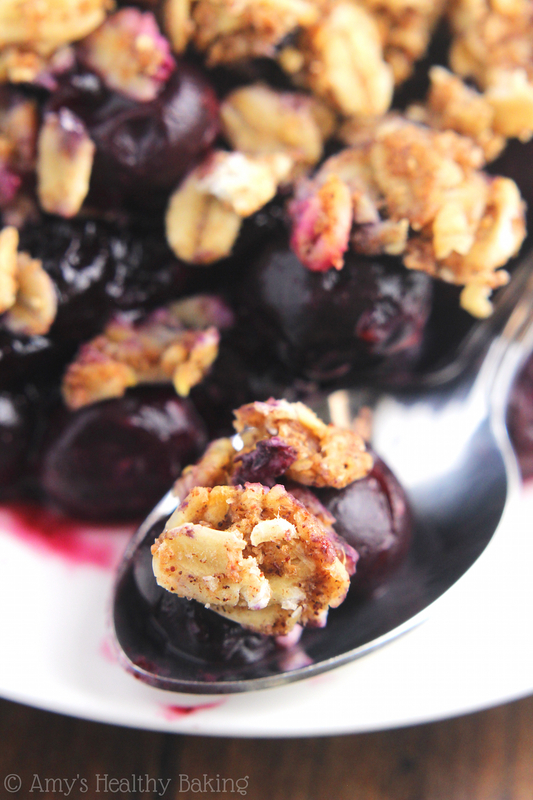 A sweet almond-scented blueberry crisp topped with a cinnamon-spiced oat streusel. 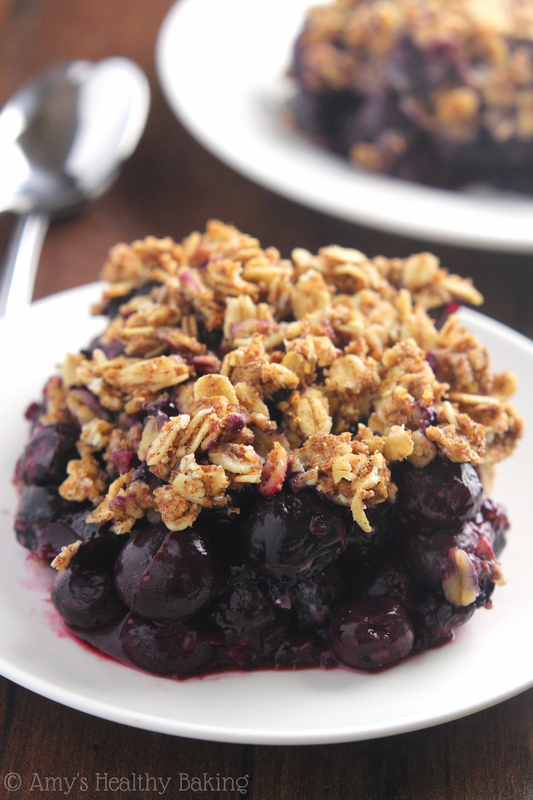 This irresistible dessert is still healthy enough for breakfast! This past weekend, after one of my best friends from high school graduated from medical school, her parents threw her a big party to celebrate. Their extended family and friends made up the majority of the guests, but our other best friend showed up too, and she and I spent the evening laughing, talking, and helping out our friend’s mom behind the scenes. We offered to set out the dinner plates for the gourmet Indian food buffet, pass out glasses to all of the guests for the toasts, pour sparkling apple cider and champagne, and serve everyone slices of the congratulatory tres leches sheet cake during the heartwarming photo slide show at the end of the night. During the long moments in between taking care of food and drinks, the two of us sat on the wraparound porch in the spacious backyard, overlooking the pool and the lawn where the guests mingled and hugged our sweet med school graduate friend. Since five months had passed since we last saw each other, we spent hours catching up and sharing the really deep, personal stories that had surfaced during our time apart. In those quiet minutes where dusk turned to darkness, I realized how important it is to have soul mate friends. The ones who understand you and love you, who pick you up when you fall down, who stand by you through your best and not-so-great moments, who laugh at your jokes and give you as many hugs as you need. They’re the ones you can talk to every day or twice a year and it doesn’t matter because you’ll pick up exactly where you left off. I’m so lucky to have those two girls. At the end of the party, when the stories had been told and the stars twinkled above, we sat at the empty dinner tables while our friend’s cousin started playing upbeat Indian music through the stereo speakers. And when most of the family ran out to the backyard to dance, our friend’s mom pulled us both onto the dance floor where her aunt taught us how to jump to the bass beat, wave our arms, and twist our wrists like everyone else. Dancing like that is the perfect stress relief. Moving to the rhythm, shaking our shoulders and arms and hands, twirling and laughing, hopping around until our calves hurt and our lungs gasped for breath… It was exactly what my body and soul needed. Friends, laughter, dancing, and joy. Just like soul mate friends are good for the body and soul, food can be too. Especially dessert. 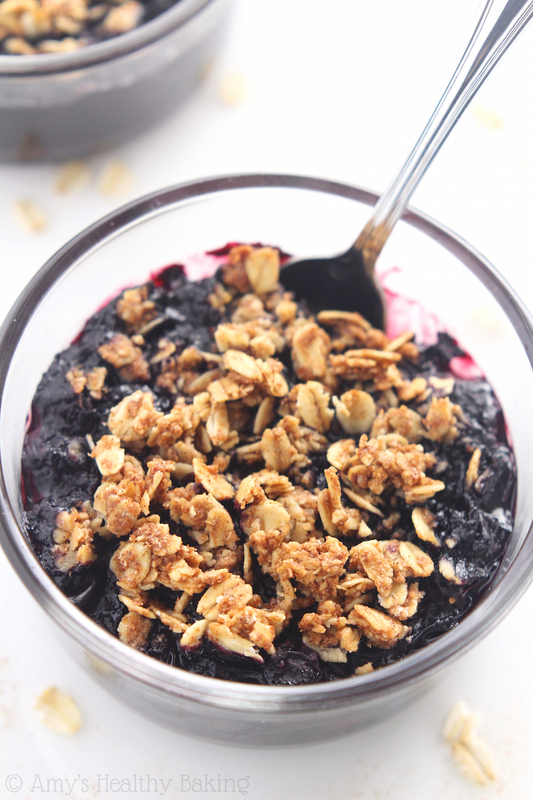 Like this Clean Blueberry Almond Crumble! 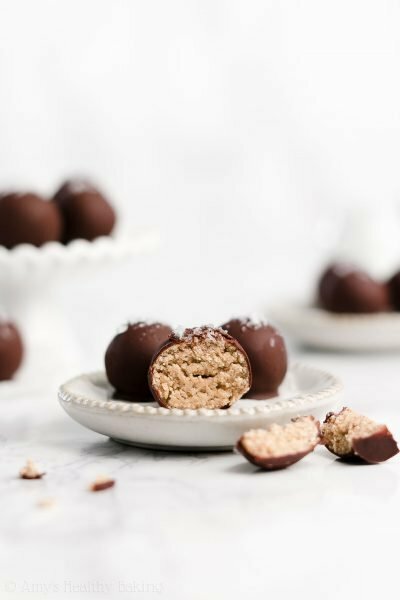 It’s made with wholesome, clean-eating ingredients that my body loves, but it still tastes sweet like the treats that my soul craves. It’s the best of both worlds! 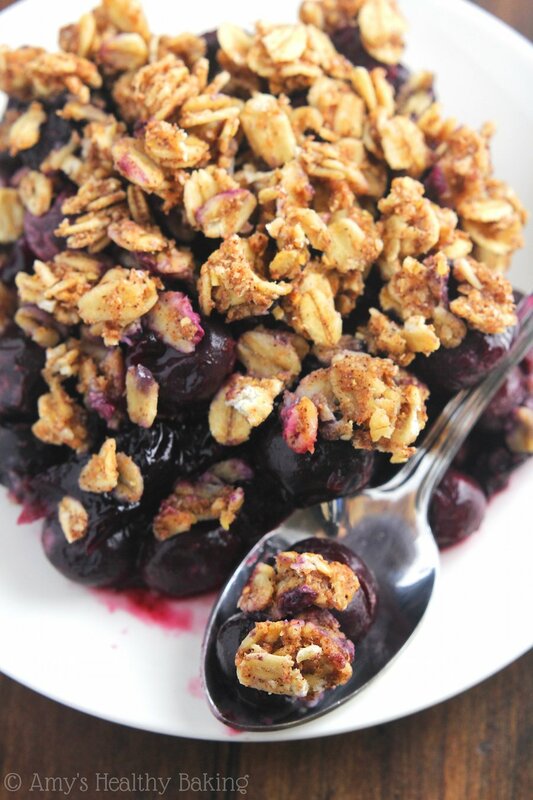 The filling consists of just 3 ingredients: blueberries, cornstarch for thickening, and almond extract. 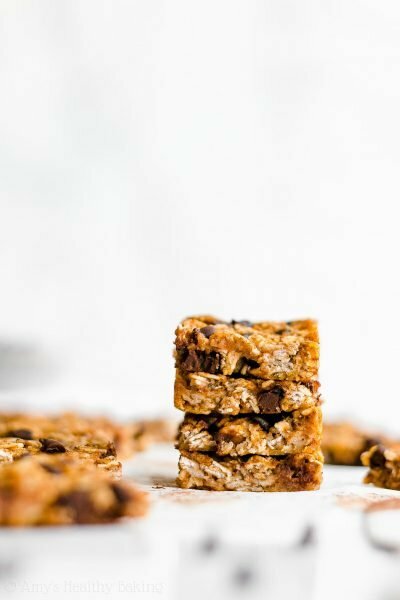 Almond extract is my favorite flavor for baking! Its sweet aroma reminds me of my chemistry days (I worked with a particular chemical with the exact same smell! 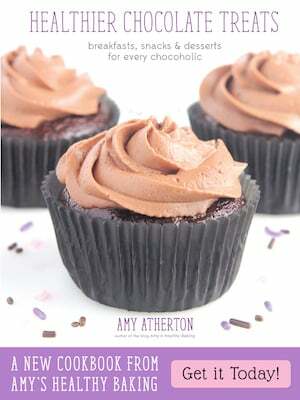 ), and its flavor adds a sophisticated note to any baked treat. 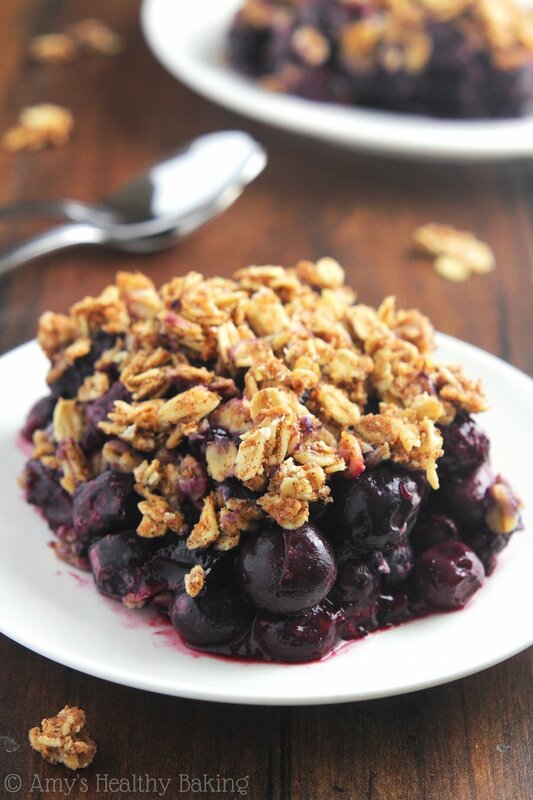 I prefer frozen blueberries over fresh for crumbles because they’re usually cheaper and readily available all year round. Besides, when berry season comes, I can never seem to stop myself from devouring all of the fruit fresh from the fridge! But if you’re fortunate enough to have your own blueberry bushes or find a great deal on fresh ones at the store, those will work too. The crumb topping is always my favorite part! I save the biggest chunks for last… Always have, always will. This particular topping is super easy because it involves melted butter and maple syrup, so you just stir together all of the ingredients. No cold, hard butter to cut into the oats and flour! 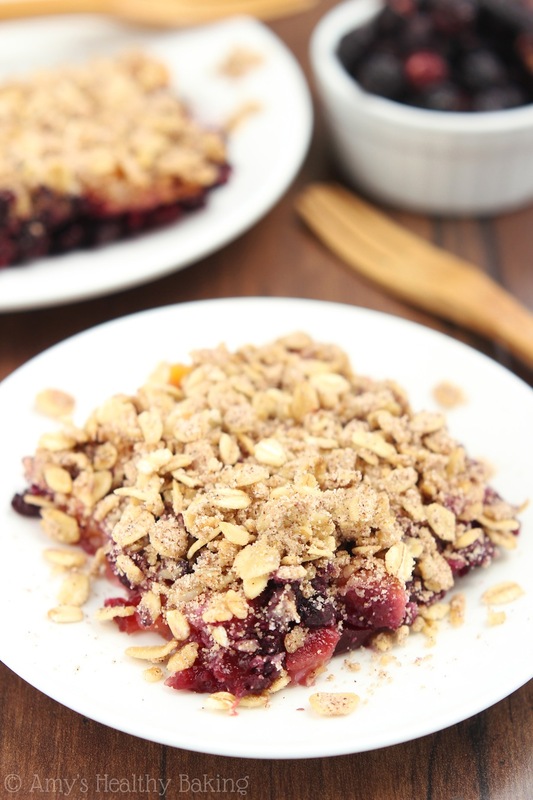 However, because of the maple syrup, this crumb topping tends to be a little wetter than many traditional recipes, so it may stick to your fingers when you sprinkle it over the blueberries. I have no problem with that—it means I get to lick off later! 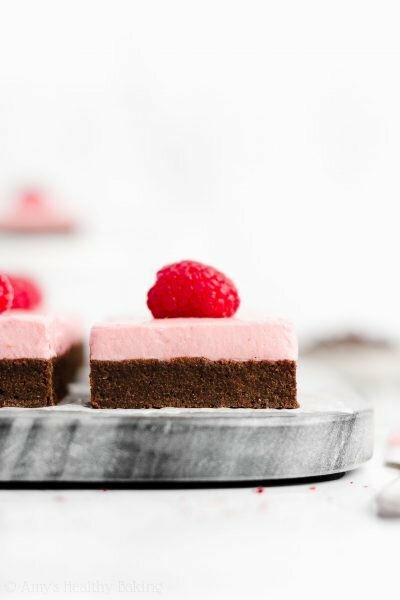 Note: If you prefer a sugar-free topping, I included that as an option in the Notes section beneath the recipe. Now who wants a big slice with ice cream for dessert? Or a piece plain for breakfast? I won’t judge—I’ve already done both! 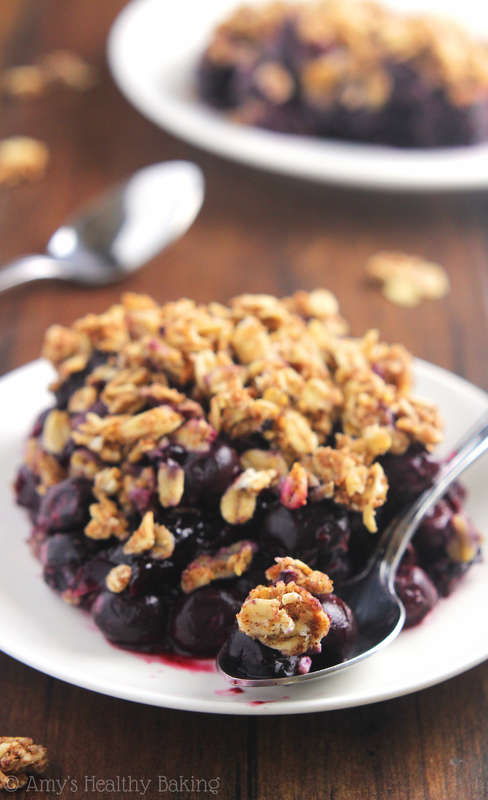 With the elegant taste of almond extract in the blueberry filling and the cinnamon-spiced oat streusel on top, this easy dessert always disappears quickly—especially when served with ice cream! If you happen to have any leftovers, eat them plain for breakfast the next morning. I won’t judge! 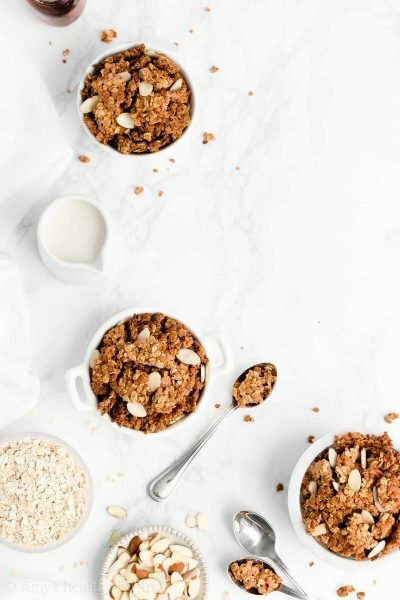 To prepare the oat streusel topping, whisk together the oats, flour, and cinnamon in a small bowl. Add in the maple syrup and butter, stirring until completely incorporated. To prepare the filling, stir together the blueberries, cornstarch, and almond extract in a large bowl until thoroughly combined. 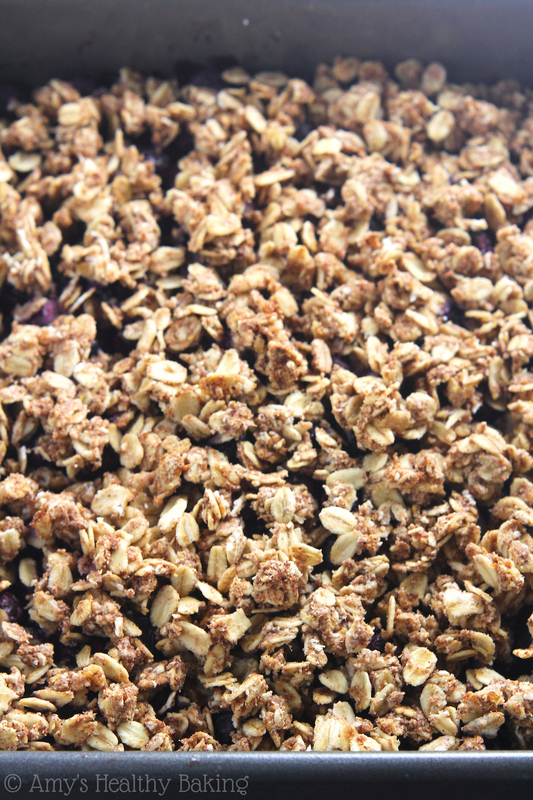 Transfer the filling to the prepared pan, and sprinkle the oat streusel on top. Bake at 350°F for 50-60 minutes, or until the blueberry juices are bubbling at the sides. 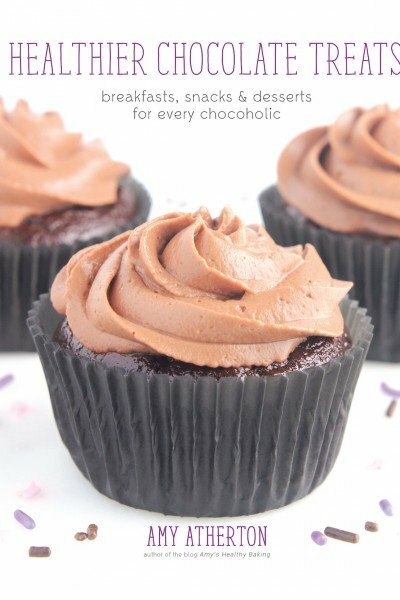 Cool completely to room temperature; then chill for at least 3 hours before serving. Notes: For a vegan version, substitute Earth Balance buttery spread in place of the butter. The crumble will last for at least 6 days if covered and chilled in the refrigerator. Can you use something in place of the cornstarch? I don’t typically use that and wanted to see if you have a suggestion for a substitute? Thanks! The cornstarch is what thickens the juices that the blueberries release, which is really important for the final texture of the crumble. You can try substituting another starch like tapioca starch, but you’ll need to use twice as much. I’d love to hear what you try and how the crumble turns out Sam! cornstarch is actually not clean, I used almond meal and skipped the almond extract. can I sub vanilla extract for the almond extract?? Yes! 🙂 I can’t wait to hear what you think of this crumble Aimee! Yes! What we call cornstarch in the US is called cornflour in the UK. 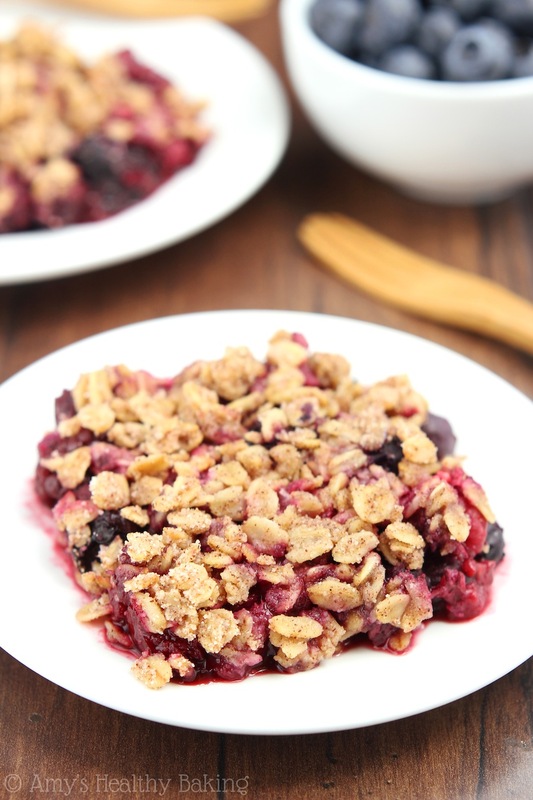 🙂 I’d love to hear what you think if you try this crumble Margi!